While March Madness plays out on the court, we’ve got a competition on the sidelines. Welcome to Leafly’s Strain Madness, where your votes have decided which strain gets dubbed the champion of all cannabis. All week long you’ve been voting to see your favorite strain through to the final. Today we reveal the champion. After four rounds of intense competition, we can crown the champion of Strain Madness 2019. Every day this week we asked you to share your thoughts by voting for the best strain and your favorite terpene profile. You all did not disappoint! The early matchups had some wild outcomes. White Widow made an unpredictable comeback in the first round against Green Crack, and GSC unceremoniously knocked off one of its legendary parent strains, OG Kush, in round two. The championship matchup followed the same unpredictable path as Granddaddy Purple, winner of the myrcene-division, went up against the limonene-dominant phenotype of Sour Diesel. Receiving 58% of votes in the final matchup (and over 31% of votes in each round), we finally have a champion for our 2019 Strain Madness. Granddaddy Purple lovers rejoice! This is a strain with a strong reputation for its rich violet hues, large chunky flowers, and soothing and relaxing effects. First released by breeder Ken Estes in California in 2003, Granddaddy Purple is more commonly called GDP, Granddaddy Purp, or simply Granddaddy. GDP is a cross of two stout indica strains: Big Bud and Purple Urkle. Both parents have a recognizable influence in this cultivar’s combination of characteristics, notably its sizeable flowers and deep purple coloring. In addition to its visual beauty, our champion strain is appreciated for its potent, full-bodied relaxation. The flowers of GDP erupt with a sweet berry aroma and subtle earthiness before its calming, sleepy effects take hold. The aromas, flavors, and effects of GDP are attributed to its chemical composition and the combination of compounds, like its array of terpenes. 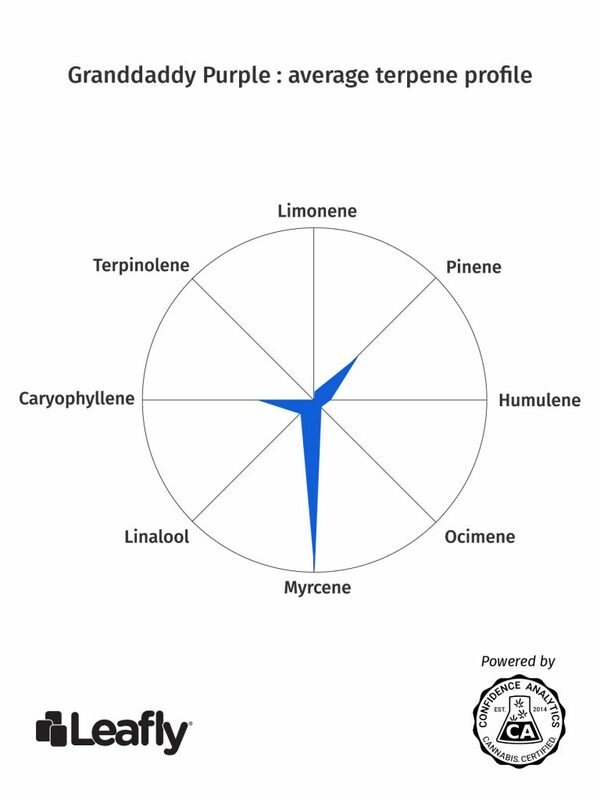 This snapshot of Leafly’s verified lab data helps us see GDP’s primary terpene, myrcene. Myrcene is the most common terpene in cannabis strains. It has an earthy, herbal aroma when isolated by itself and shows medical potential for managing pain, reducing stress, and helping with insomnia. But myrcene isn’t the whole story. You’ll also notice secondary terpenes like pinene and caryophyllene in the mix, as well as minor terpenes like linalool, limonene, ocimene, and humulene. All of these terpenes work in unison with a high-THC content to produce GDP’s classic flavors and effects. Thanks for playing Leafly’s Strain Madness! We hope you have a better understanding of some of Leafly’s top strains and of terpenes and how they interact to create different flavors and effects in cannabis. Check out more information on terpenes on Leafly. Not sure why this strain won? Leave a comment below! Yes GDP is an awesome relaxing strain. 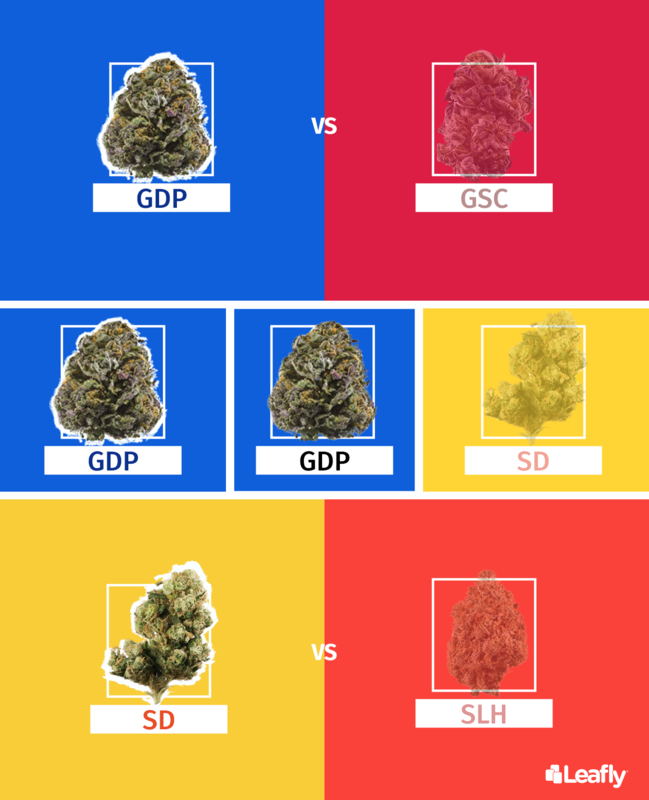 But my favorite and it’s on the opposite spectrum of GDP is Strawberry Cough. But GDP is hefty producer that’s for sure. One thing that I like about Strawberry Cough is that it’s totally anti anxiety and when you come off of it it’s like you’re totally sober again and your head isn’t cloudy like when you’re coming down from most other strains. It’s makes you feel a little more awake and social even. But sadly Strawberry cough is a cutting only strain and you won’t be finding any naturally occurring seeds. It’s a little hard to find, but I hope as it’s potential is realized, that it’s availability becomes more widespread with it’s popularity. Totally with you on Straw Cough, seriously one of my faves and your right, it’s a bit elusive, and to my knowledge, it’s lineage is mysterious, but I agree, it treats me like a good amazing sativa, and never gives me droop eye or raciness I get with ironically indica dominant OG, for ex which can give a spike of anxiety and cause droopy eye. I said this on the other ‘chapter 4’. I’d love to see a sativa vs. sativa (pure sativa, w/all sativa lineage for the most recent breeding/cloning). What’s really best is Super Sour Diesel because it is more a true sativa and amazing, whereas SD still has a hybrid and indica parent lineage, SSD has total sativa lineage which is best for preventing droopy eyes and a really exhausted looking face. What the hell ever happened to Jilly Bean?! Such unique phenotypes. I miss it. Then Golden Goat. My goodness! Pain relief, relaxation? Doesn’t anybody just get high anymore? I use cartridges and have used lots of different strains but so far nothing to just get high on. I’m 74 and a newbie to vaping. PTSD troubles me and quite a bit of pain. Some of these strains help with that but what about just getting high? Sometimes it’d be pretty nice. I agree, and my favorite strain for the euphoric feeling of being high is — SPACE QUEEN — great for stress, fatigue and depression. I am 60 years old and have fibro, this strain puts me into a state of blissfully being high. I heard that! To get high is not the objective of this medication. The objective is to heal.